Sometimes you have to hit the 'bay if you want to add some things to your collection. As much as you hope another blogger can get their mitts on some sweet cardboard, ultimately you need to open your wallet and deal with shipping costs. Here's some recent pickups online. From a vendor that had a flat shipping of $2.50 for as many cards as you buy, I picked up a dozen '58 White Sox for the team set. After all was said and done, I paid just over a buck per card. And quality wise is pretty high. All the cards are in great shape. 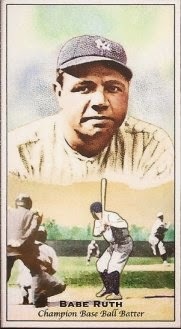 Just a single Kimball - card #100. I snagged this for a $1.45 with shipping from Sportlots. This Ruth completes the Kimball Champions set. I'll scan the entire set on another post. Just glad to knock this one out. 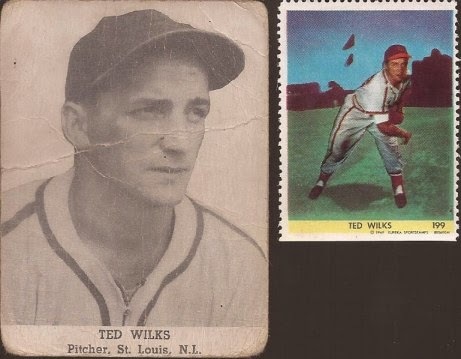 My first two additions to the Ted Wilks project. I figured that TipTop card on the left would be extremely hard to find. I lucked out last week, randomly searching and found this one for $13 with shipping. The Eureka stamp was a pickup for $3. Five cards left to complete. The same night as the TipTop I sniped this Fox Red Man card for $3.25. 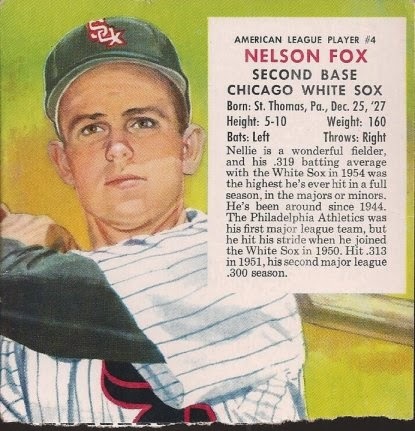 I threw in a Buy It Now of a '63 ChiSox Mike Joyce since shipping was combined. Just over $7 total. Someone did a number on the tab, but I have yet to find a Red Man of Nellie for under $15 with or without the tab. 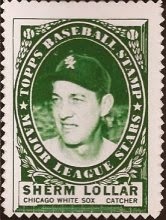 A nice '61 Topps Stamp for the Lollar collection. I was happy someone separated this and sold it alone, as every auction I have ever seen of the Sherm stamp is attached to a stamp of the Say Hey Kid. Picked this up for 10 quarters with shipping. I didn't know these Fleer Futures came in a black parallel. 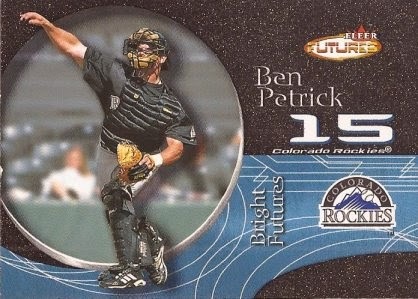 Luckily, my saved search for Petrick cards pulled this up. Set me back a buck with shipping. I took a chance, spending $6, on a 130 card lot of Konerko. The images had a bunch of dupes, but I figured if I found 25 new cards for the collection, I was ahead of the game. I added 53. I was able to add a few new cards to Jeff's Konerko collection at My Sports Obsession. Plus, if I so desire I have a nice amount left to try for TTMs. Solid pick-ups all around, and it sounds like you got some good deals, too. You sent me more than a few Konerko's I needed. I should start posting a bunch of the cards you sent me soon. Thanks for both packages. Nellie looks like a beauty even with his border issues. Overall great condition otherwise, as are the 58s! Congrats on the Kimball set. I have a mini-set of the old timers, some of my fave minis ever. Great stuff Jeff. Besides trading, spending money online is about the only way for me accumulate cards I need.